Nosy Sakatia, an Island away from an Island is a nature’s Paradise, situated on the west coast of Nosy Be, Madagascar. Sakatia Island offers the typical unspoilt tropical fauna and flora of this area, only 6.5 km long and 2 km wide at it’s widest point, it has a current population of ±450 inhabitants, no roads only foot paths, with which one can wonder at leisure and explore it’s beauty and deserted beaches. The island is fringed by spectacular coral reef to be enjoyed by snorkeler or scuba diver alike. Sakatia Lodge is situated at the foot of the Sacred Mountain and Nature Reserve. The maximum capacity of the lodge is twenty six guests, we have a lounge / bar area, separate restaurant all overlooking the ocean and fringed by the sacred forest of Sakatia. Be tempted by the chef’s fantasy in a blend of tropical cuisine. Your hosts and staff will ensure that you have the getaway of your dreams. 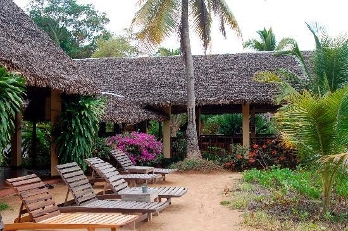 Sakatia Lodge organises other activities such as Quad Biking, Deep Sea Fishing, Horse riding, Tracking and exploring other Islands within it’s vicinity. Or just simply “ Mora Mora “ the Malagasy term for slowly, slowly. The Dive Centre is affiliated to DAN SA and offers Scuba diving and NAUI diving courses, from “discover snorkelling to Instructor as well as speciality courses, NITROX, Night Diving, Environmental Diving, Search and Recovery.